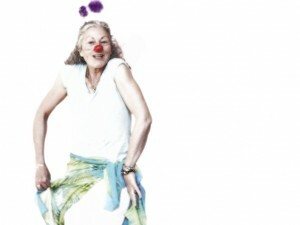 A five-day Clown Improvisation and Creative Dance workshop to wake up our movement imagination and discover the clown in motion. A Clown workshop in which you will find yourself dancing. Do you feel a bit off balance? Do you bump into yourself? Do you trip over your own feet? How can we trust the messages our body is sending? When we notice and become curious of our own movements: a tapping foot, a yawn, a stretch, a gesture, a rhythm, we begin our personal journey into play and authentic discovery. We connect to our playful spirit. We develop and sustain in ourselves and each other the courage to be who we truly are, to trust life and ourselves. We befriend the fears that block us from being fully present in the here and now. The path of the Clown is simple, vulnerable and naive reminding us to dance lightly through life. We find the freedom to use our natural creative resources in Dance. As we become aware of the inner impulse that guides the initiation and completion of each movement we make, we develop understanding of organic form. We learn to let the Dance grow out of itself. As we discover our unique abilities for movement expression through Dance improvisations we aim to experience an inclusive creative community that celebrates the individual and taps the power of group unity. Believing that Dance is a basic human need, Barbara Mettler (1907 – 2002) explored new approaches to both the body as instrument and movement as the material of the Dance. Her way of working emphasised individual and group Improvisation as a means of cultivating the natural, creative movement resources which are in everyone. Mettler’s pioneering research, exploration and practice of large group Dance Improvisation is recognised as a ground breaking and unique contribution to contemporary Dance.